The wave of unrest on the London streets might be nothing else than just uncorked vandalism and furious anger. Still, it does tell something about a society, even if, at the margins - as you would say, prime minister. Damaging own backyard and looting own high-street is a sign of a complete alienation - from state, from community, from space these people inhibit. There might not be a great cause engaged, but there is a great lesson to take about people fears and anxieties. Welcome, Mr Cameron to your broken society. You wanted to see Britain as broken. So it is indeed becoming broken. Aggression bursts out not when people are poor and lazy. It bursts out when people are hopeless, when they no longer feel part, when they no longer belong, when they no longer see that there is a future. You divided Britain, you disconnected people them from the government, you made them torn apart from state. Not by introducing the cuts, increasing taxes and university fees. But by refusing to bother you to explain, refusing to bother engage people, refusing to recognize large parts of society as needed and wanted. You said that 'we are all in this together'.. and than you you left many British people for themselves. No, I am not saying that the wave of violence is your fault, prime minster. 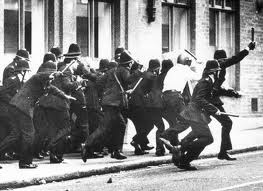 What I am saying is that you cannot just sum up what is going on in London as 'criminality' and leave it to the police. If you want to go on with business as usual, you need to open up your business not to Murdoch family but those who looted the shops and to the frightened Londoners. I disagree on two points. Aggression may have different causes indeed, and while poverty or lazyness doesn't seem to have anything to do here it is definitely not desperation. Desperate people are just angry. These people are just greedy. I don't believe that desperation drives people to loot for 40 inch LCD TVs or X Boxes. Also, what happened later in other parts of London (especially around Oxford street) can't have anything to do with any social problem. A number of thugs noticed that the Police is helpless in keeping control in the city and abused this to get some old style plundering done. And some people just followed. The second point is that while I agree with your diagnosis of complete alienation I completely disagree with what you see as the cause. Changes like that don't happen overnight. In fact, I can't believe they could happen over a relatively stable year. I do not support any party in the UK, but if anything I would blame the socialist attitude of the previous 10 years that raised a whole generation on benefits without any respect for work (or value, property). It is not a coincidence that council estates are usually the most worn down places. For economic reasons (that started couple of years ago), many people can't find work; but many also don't want to work. The cuts introduced by the current government have yet to be felt (and then, I'm afraid, you may see desperation on the streets), and the full future consequences to be understood by the People. And even the government perhaps. But only since then, I'm afraid, you will be completely right.